The technology can restrict transactions based on pre-established policies, such as restricting users to specific stores when sending money. Fujitsu Laboratories has developed blockchain-based security technologies for secured handling of confidential data between multiple organisations, with plans of bringing commercial products to market next year. The project, co-developed by Fujitsu teams based in Japan and the United States, consists of two technologies. The first is a transaction restriction technology based on pre-established policies to restrict trading, such as by restricting users. This technology can restrict transactions based on pre-established policies, like restricting users to specific stores when executing transactions. In India, for instance, NFC tags are being used to make it easier for the consumer to share the information with the merchant. In comparison, Fujitsu's technology provides a new framework that ties policies to keys used in activities such as capital transfers. The technology ensures that initiated transactions which violate policy requirements are prohibited from getting added to the blockchain as a result of verification failures at multiple computers participating in the blockchain. This makes it possible to limit damage even if a key were to be stolen (Figure 1). The second is a document encryption technology, which allows only relevant parties who hold multiple distributed keys to securely access the information recorded in the blockchain. With document encryption technology, it is also possible to create a workflow where documents are acknowledged by collective decision making or between specified organisations, or where they can be restored when keys are lost. The application of these security technologies will enable Fujitsu Laboratories to contribute to expanding the applicable fields where blockchain can be used, beyond finance to a variety of areas, such as logistics, supply chain, and official document management. Storing documents in blockchain can guarantee that the original state of the document will be preserved, but because the content is public to blockchain users, this method is not appropriate to store documents which contain confidential information. Now, Fujitsu Laboratories has applied a secret sharing-based key management system to document encryption, where different portions of a key are held by multiple users (Figure 2: Mr. A and Mr. B), and once a specified number of pieces have been gathered, a key can be generated. 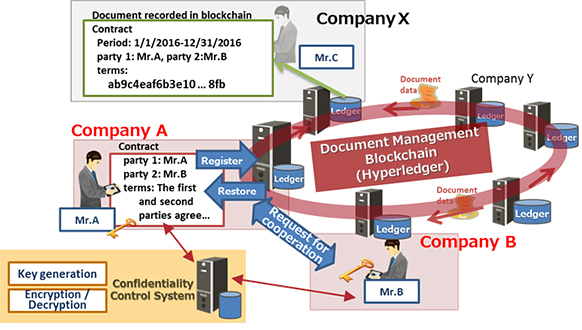 This enabled Fujitsu Laboratories to develop a blockchain document encryption technology which can control who can read the contract documents, where the confidential portions of the contracts will not be visible to ordinary users (Mr. C), and enabling document anonymity control. It can only be read when the parties involved, who hold portions of the key, work together. Fujitsu Laboratories has developed a prototype system on the Hyperledger, an open source blockchain platform (Figure 2). Fujitsu Laboratories is carrying out trials of the applicability of blockchain to business in finance and a variety of other areas, as a cloud platform that can safely and securely handle confidential information and personal data between multiple organisations.